What is TeraThink’s role in Shared Services and how do we apply it to our solution areas? I found myself thinking about this question while I attended the AGA/IAC Shared Services Summit last week. Within the industry, most agree with the long term vision of this most recent Shared Services initiative, which is consolidating Financial Management to four approved Federal Shared Service Providers. 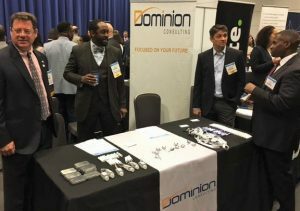 I listened to a number of excellent speakers talk about the importance of moving to Shared Services, the benefits with respect to minimizing Total Cost of Ownership, bringing efficiencies in how the government operates financial management, and most importantly allowing an agency to “focus on its mission”. I agree with all of those principles, but I also found a common theme amongst the speakers…the need and want for agencies to do something that is often lost in government…and that is build trust. Trust is something I have often heard from my clients when discussing Shared Services. The thought that “we have been doing this so long, no one else does it like us”, so how can we trust another Federal Agency successful manage our financial management system in a Shared Service environment. In following the M3 Playbook for Shared Services, after an agency chooses a Shared Service Provider, the next phase is Discovery. As the IV&V contractor providing Management Consulting for the USDA’s Shared Service Center, I have tried to think about our role within this Discovery Phase, and how we will best impact the VA’s decision to migrate their Financial Management to USDA. We are just now participating in planning, how will we define requirements, does Pegasys meet the VA’s needs out of the box, does VA need to change its business processes, etc. And we will play our role with respect to all of those tasks per the project plan. But what has struck me is that probably our most important role will be in helping both the VA and USDA trust one another, and trust that they are working towards the same goal. How can we help bridge that trust in our role as an independent entity within the team? I believe that is the single most critical element to the success of Shared Services, and something myself and the team will be reinforcing throughout the course of Discovery. If we can be successful bridging that trust, I believe that future migrations to Shared Services will incorporate that as the guiding principle within their programs. We’ll be sharing our story as it continues. In the meantime, what are your thoughts? Share them below.